* You are viewing an old article – Our story on the Christmas Eve Blizzard of 1982 has been updated! Click here to view the new version which includes some great photos. Looking back through history, Denver and Colorado have had some extraordinary weather stories. When looking to pick a “best” or most significant weather event, reaching far back into the history books one might choose the Georgetown blizzard of 1913 which dumped an astonishing 86 inches of snow or perhaps the Big Thompson Flood of 1976 which claimed 145 lives. More recently, there were the holiday storms of 2006 or the Windsor tornadoes from 2007. But, there is one storm that historically stands out not only because of its severity in terms of the weather but also because of the long lasting impact it caused in Denver and Colorado which is still being felt today – the Christmas Eve Blizzard of 1982. For those of you that didn’t live in Colorado then or are too young to remember, a trip through the history books shows why this storm was so significant. Those that do remember it have memories that will last a lifetime. The weather setup for the Christmas Eve 1982 Blizzard. A perfect storm with cold air from the north, warm moist air from the south and a forceful jet stream from the Pacific. As Christmas 1982 approached, forecasters were predicting a white Christmas several days beforehand but most were expecting a moderate snowfall of 6 inches. Two days before Christmas Eve though, the picture began to change. On the 22nd a Pacific cold front came ashore in California bringing severe rain, high surf and even hurricane force winds. As it moved east over higher terrain, it dumped 2 feet of snow in the Wasatch Mountains near Salt Lake City. 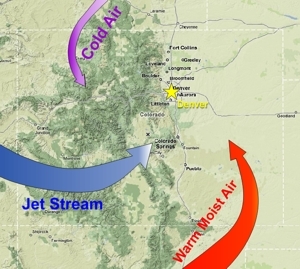 At about that same time, jet stream winds were forming a trough of low pressure over the southeastern plains of Colorado. The counterclockwise motion of the trough began to pull moist air into the state. Further east Kansas and Oklahoma experienced severe thunderstorms and even tornadoes. The winds set the stage for strong upslope conditions along the Front Range. Rain changed to snow on the plains and shortly before midnight on the 23rd, a full blown blizzard had developed. Denver woke to snow on the ground the morning of Christmas Eve but the storm was just getting started. Snowfall rates of 2 – 3 inches per hour were the norm during the day and winds screamed at 50mph causing wind chill temperatures to plummet to as low as -35 degrees. As conditions continued to deteriorate throughout the day, the gravity of the situation began to be realized. 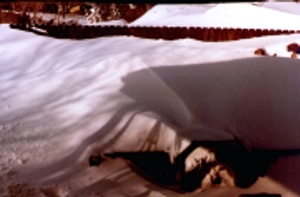 The aftermath – Six foot snow drifts were not unusual. This image was taken in Northglenn the day after the blizzard. Stapleton International Airport was forced closed at 9:30am on the 24th and remained closed for 33 hours and only limited operations were possible for days following the storm. Thousands of travelers were left stranded in the airport and forced to spend their white Christmas on the concourses of the facility. Last minute Christmas shoppers quickly found themselves wishing they hadn’t procrastinated. Malls and shopping centers became refugee centers as the city shut down and became impassible. Mall workers were unable to go anywhere so the mall restaurants stayed open providing food for those who were stuck. For the first time in history the Denver Post and the Rocky Mountain News were unable to publish their newspapers. 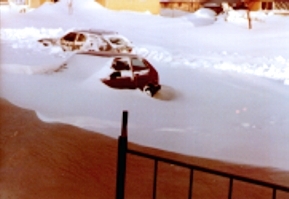 4 – 10 foot snowdrifts covered many areas of the city, built by the extreme winds and snow. Every mode of transportation was paralyzed and every highway into and out of the city of Denver was closed. The snow totals for the storm were nothing short of incredible. Golden Gate Canyon to the west of the city received 48 inches, Thornton 34 inches, Littleton 29 inches and Denver had 25 inches. Denver’s 24 hour total was a record which still stands to this day. Colorado’s bizarre weather can truly be seen also when looking at the snow total for Greeley – a mere 45 miles north of Denver – where only 1 inch of snow fell! The aftermath of the storm took weeks to recover from and the toll was astounding. Three people died as a direct result of the storm and there were many injuries from frostbite and falls. Roofs collapsed across the city striking greenhouses especially hard whose damage alone was estimated at $5 million. Fences and trees were downed and power outages were common. The local economy took a tremendous hit as the second busiest shopping day of the year was a bust – it is estimated that area businesses lost $500 million in holiday sales. The removal of that much snow proved to be a huge effort and is probably what made this storm historic as it brought an end to a political era in Denver and in some ways, it could almost be said to have indirectly brought about the construction of Denver International Airport. Bill McNichols was the mayor of Denver at the time and was in his 15th year leading the city. He was considered relatively popular at the time but the city’s handling of snow removal is thought to have directly led to his defeat in the mayoral elections the following May. $7 million was spent across the metro area on snow removal; $3 million in Denver alone. However, Denver’s 45 snowplows simply weren’t enough to handle the task and the city was slow to even clear major streets. The after math – snow made streets impassable. This image was taken in Northglenn the day after the blizzard. To make matters worse, the misery of the storm was only prolonged by cold weather in late December and through January which left snow on the ground for 48 consecutive days – the third longest period on record. The snow could easily have lasted longer except that perhaps mercifully, no significant snow fell for two months after the blizzard. Heading into the May elections the next year, the calamitous storm was fresh in voters’ minds as they went to the polls and a new era in Denver politics began when a young man half the age of his predecessor was elected to office – Federico Pena. Mayor Pena’s election brought about the end of the Bill McNichols’ era in Denver politics and Pena became the driving force behind the construction of Denver International Airport. For better or worse, if it weren’t for the Christmas Eve Blizzard of 1982, Federico Pena may never have been elected and we may still be flying out of Stapleton International Airport. Due to the timing of the blizzard coming on Christmas Eve, the sheer amount of snowfall, the impact on the city at the time and for the longlasting political implications, the Christmas Eve Blizzard of 1982 is number one on my list of Denver’s “best” storms. This entry was posted on Wednesday, October 1st, 2008 at 7:48am MDT and is filed under Colorado Weather, Thornton Weather, Weather History. You can follow any responses to this entry through the RSS 2.0 feed. Both comments and pings are currently closed. Got caught in Hay KS as the storm passed thru…was on my way to Denver from North Carolina to start my job with Piedmont Airlines. Made my date of employment easy to remember 1/1/83…..and boy did they need help!! @Michelle Cline…The storm was fierce but quick. The snow began shortly before midnight on Christmas Eve and lasted just a little over 24 hours. Christmas Day dawned clear but VERY white. The whole impact would have been at least somewhat less on Denver at least if the mayor had not ignored the weather forecasts and given the street crews the holiday off. This was one storm that “solar snow removal” was not going to work on. Yes I remember it my son was a student at CSU he was married and had a new baby. He wanted to drive to my house in Thornton for a family Christmas. I called him to tell him to stay home we would celebrate later the snow was already very deep. He was in Ft. Collins and he didn’t see any snow that’s right it snowed here but 50 miles away no snow so he got his family in his car and headed this way. He was fine to just this side of the Eerie exit. Then it took 2-3 hours of one lane open only on I25 to get the last 20 or so miles. I had to dig a parking place for his car on the street and defend it from poachers as I don’t have a driveway. So anyway he got here all were fine he stayed a couple of days and everything kind of melted away. The article notes that the storm was fresh in voters’ mind next May and led to the defeat of Mayor McNichols. What was not noted was that May 17 dawned with a full blown blizzard in the Denver area, just in case any voters HAD forgotten the issue. I was working at TWA and was on the day shift when we were having the Blizzard. It just got worse and worse. By the end of the shift we could not even get a crew bus to the parking lot located near I-70, and as a consequence we had to spend Christmas eve at the airport. The next day-Christmas, Stapleton’s “Tonga Line” (the crew that cleared the runways) had helped clear the road to the I-70 parking lot, but not the lot itself where vehicles were covered with snow. So our mechanics took our aircraft tow tractors, and went down to the parking lot, and pulled each and every one us out one or two at a time to where we could get to the access road out of the employee parking lot. By that time the city of Denver had begun to clear I-70. I did not get home until mid after noon Christmas day. We had company, and if my memory serves correctly, we didn’t open presents until I got home. I wanted see my daughter open her presents. I wanted to see the expression/excitement on her face as she opened her presents. What a time to have a Blizzard!!!! We have updated this story with a new version that includes some great photos. Please click here to visit that page and comment there. We love hearing everyone’s thoughts on this amazing storm!